Atlanta is a beautiful bedroom furniture collection by Bentley Designs which is available in a choice of finishes including oak, two tone and white. Made with strong, solid wood frames, Atlanta offers quality and practicality whilst adding an element of style to any bedroom. At Coytes Furnishings, we currently supply a choice of Atlanta bedsteads, headboards, nightstands, dressing tables, wardrobes and chest of drawers in a variety of sizes to suit any size bedroom. 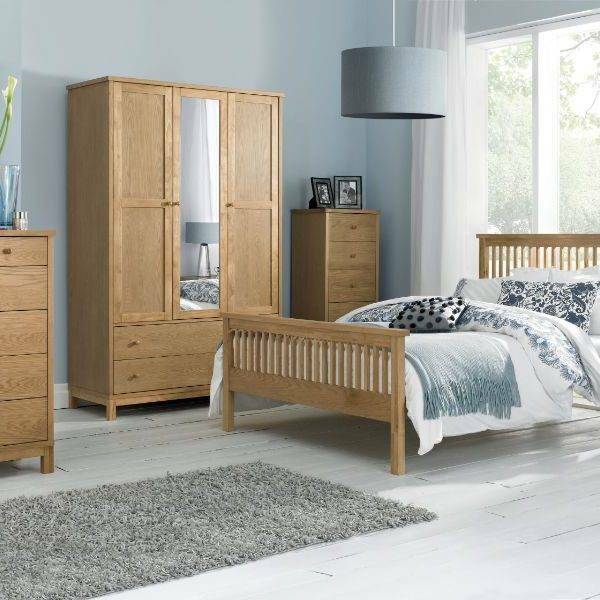 Atlanta Oak is an elegant bedroom collection which is crafted using solid wood frames and oak veneered panels, all of which are finished with a hard wearing lacquer. Atlanta Two Tone bedroom furniture has a fresh white finish which contrasts elegantly with American Oak veneers which are coated in a hard wearing lacquer. Atlanta White bedroom furniture is ideal for all styles of bedroom decor. Crafted with solid wood frames and finished with a hard-wearing lacquer, Atlanta white is perfect for brightening any bedroom!